A chef’s restaurant recommendation is one of the best you can get. Ask Mike Leckrone to sort through a half century of Badgers memories for a favorite and he'll give you the 1994 Rose Bowl, Wisconsin's first appearance in the modern era. Where are all of Madison's vegetarian restaurants? It’s no secret — vegetarians and vegans get a bad rap in the restaurant world. The founder of UMOJA magazine steps down from her longtime role as editor but stays committed to supporting black stories. 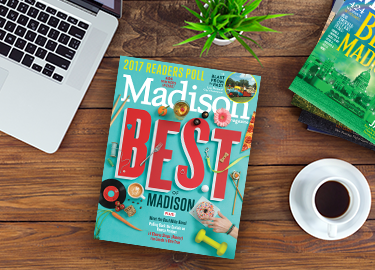 Step right up to find out which businesses, people and places were voted to the top of our 38th Annual Readers Poll. Photo courtesy of Madison Tattoo Co.
Club M is an exclusive way to experience all Madison Magazine has to offer. A FREE Nitty Gritty Burger! Get a FREE Nitty Gritty burger on your birthday!